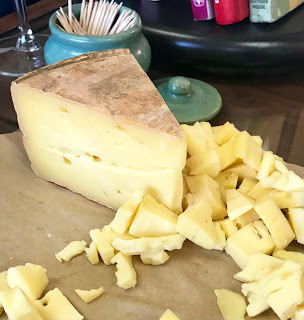 One-of-a-Kind Cheese & Wine Tasting at CalyRoad Creamery | We Like to Cook! 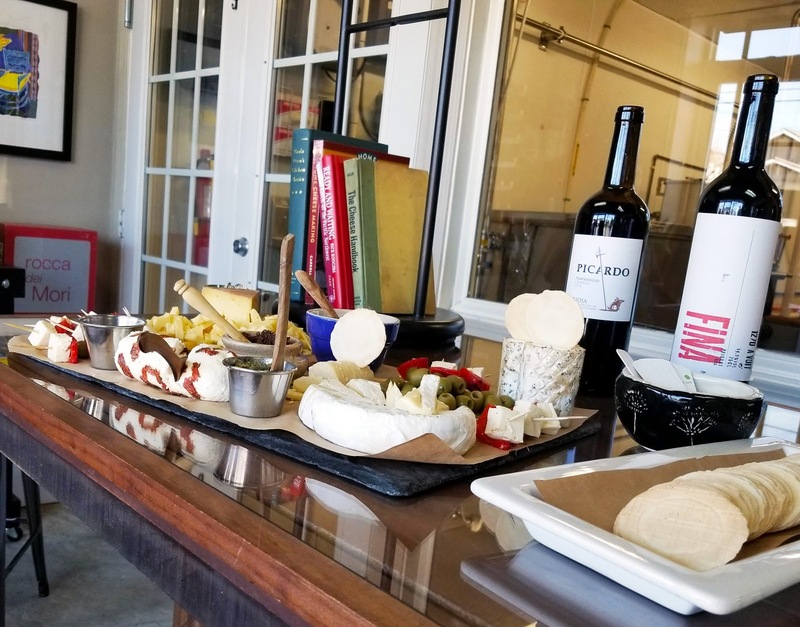 CalyRoad Creamery’s brick & mortar workshop with its petite shop and tasting room makes a cozy and intimate place for cheese and wine enthusiasts to gather for sips and nibbles. Created by two sisters who loved making cheese, CalyRoad Creamery was established in 2009 and was originally located on a West Georgia goat farm. As the business grew, they moved to operation to Sandy Springs and added cow’s milk cheeses to the menu of cheeses they offer. Hosted by owner Robin Schick and Terry Tomasello of Domaine Wine Distributors, monthly wine and cheese tastings feature unique and rare wines curated by the partners of Domaine alongside the creamy-dreamy artisanal cheeses created in the “make room” visible through the plate glass windows of the Sandy Springs cheese shop. “We take a very informal approach to our tastings. We suggest that you start with the lightest white wine and move through to the most robust red - pairing the cheeses in the same way. 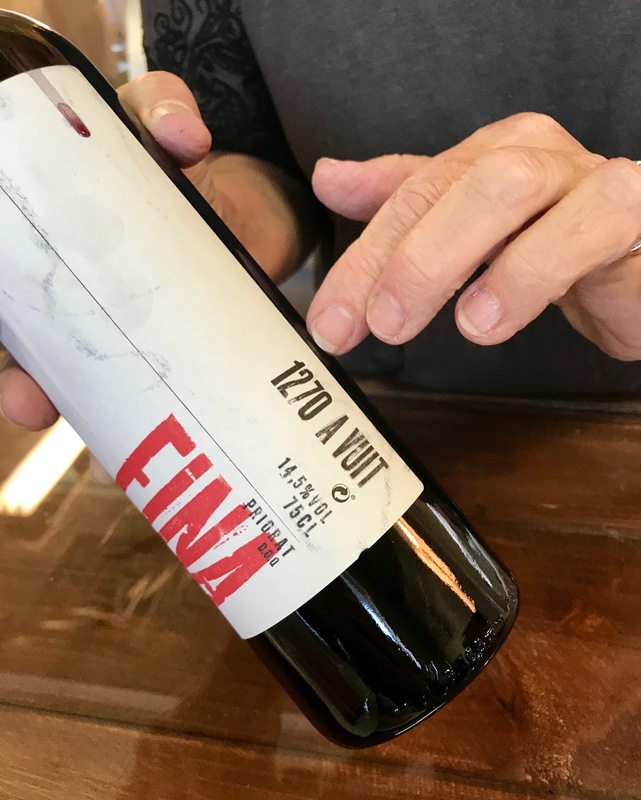 Because everyone’s palate is different, you may find a pairing that you feel is perfect that might otherwise be missed in a specific one-for-one tasting,” explains Schick. On this evening, Tomasello, as our sommelier, shared the interesting background of the three wines from Spain’s Rioja wine region. 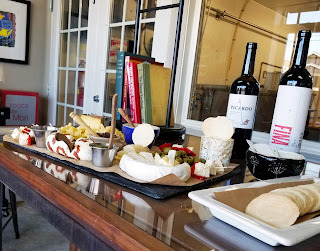 We began with Belezos Rioja Blanco Bodegas Zugober 2014; a crisp oak-aged white with floral aromatics, citrus notes and a hint of cinnamon which matched well with the fresh feta, camembert-style WayPoint and particularly nicely with the pear-cardamom chèvre. Next, we sampled a Picardo Rioja Crianza 2014; a deep crimson color with a minerally bouquet and dark berry notes which paired well with a sun-dried tomato and basil chèvre and the Black Rock aged goat cheese with crushed black peppercorns. Our last tasting was of a Celler Hidalgo Albert '1270 A Vuit' Fina; a juicy red with nice vanilla and black currant flavors, medium acid and balanced tannins that best complemented the cheesemaker’s latest release Hilderbrand Tomme with its rich, aged cow’s milk flavor, light caramel notes and mild nuttiness. As guests mingled and enjoyed their wine, they had the opportunity to shop for delicious treats to accompany their cheese purchases like crackers, lavash, honey, nut butters and preserves. To experience this unique tasting for yourself, please visit Culinary Local for more information or to purchase tickets. In addition, to monthly wine tastings, CalyRoad offers a monthly wine club with two wines and cheeses shared with members every 30 days.